The actor Asao Tamejûrô I's haimyô was Okuyama and, although he never officially held the name of Asao Okuyama I, he was considered as the founder of the line. The actor Asao Tamejûrô II's haimyô was Okuyama and, although he never officially held the name of Asao Okuyama II, he was considered as the second holder of the name. The actor Asao Tamejûrô III held the name of Asao Okuyama III from 1807 to 1818, a second time from Fall 1820 to Spring 1829, then a third time from the end of 1829 or the beginning of 1830 to the 12th lunar month of 1830. Unknown date of birth. Son of Asao Tamejûrô III and brother of Asao Tamejûrô IV, his first stage name was Asao Asajirô. He received the name of Asao Tomozô III in the 11th lunar month of 1828, most likely in Kyôto at the Minamigawa no Shibai. He took the name of Asao Okuyama IV in Edo in 1846. He went back in Kamigata at the beginning of the 1860s and was active up to the middle or the end of the 1870s. He was jitsuaku, handôgataki, dôkegata and oyajigata (in his latter years). He died in March 1881. Born in 1850. He became a disciple of Arashi Rikan IV in 1871 and received the name of Arashi Mikan. He took the name of Asao Okuyama V in January 1882. He held this name only for a few years as he took back the name of Arashi Mikan in 1884. He died the 7th of November 1885. Born in 1854. He performed in Kamigata under the first name of Danpachi (family name unknown). He took the name of Asao Okuyama VI in Fall 1889 in Kyôto. He held this name up to his death in 1899. His real name was Nakamura Komatarô. Born in 1863. 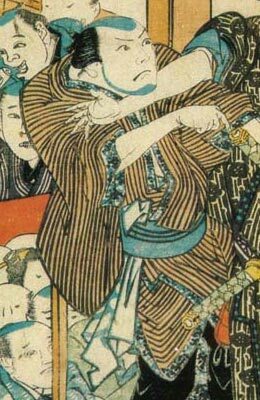 Disciple of Ichikawa Danjûrô IX from the age of 7, his first stage name was Ichikawa Ichitarô. He became disciple of Nakamura Ganjirô I in 1883 and received the name of Nakamura Komajaku. He became disciple of Nakamura Kasen I in 1893 and changed his name to Nakamura Tôzô. He took the names of Nakamura Kohakurô at the Kadoza in June 1908 but held this name only for a few months as he took the name of Asao Okuyama VII in August 1908 in Ôsaka at the Tenmaza. He was active in the movies business. You can check the link below to find the list of the movies in which he performed from 1920 to 1922. He died the 14th of November 1925. Born in Kyôto the 4th of January 1894. 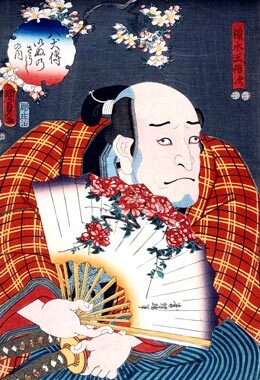 He started his career in 1900 as a disciple of the actor Asao Sekijûrô II, who gave him the name of Asao Sekisaburô. He took the name of Asao Okuyama VIII in 1930. He joined the Daiei movie company in 1956 and performed in 15 movies from 1956 to 1964. 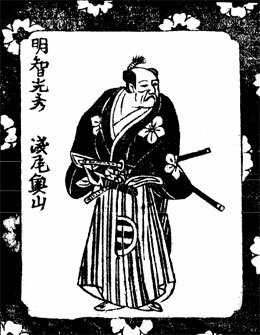 In his latter years, he often performed as a fukeyaku by the side of the Shôwa star Nakamura Kanzaburô XVII. He made his last stage appearance in July 1973 at the Kabukiza, where he played the role of Mikawaya Giheiji in the drama "Natsu Matsuri Naniwa Kagami" (the role of Danshichi Kurobê was played by Nakamura Kanzaburô XVII). He died the 29th of November 1974.